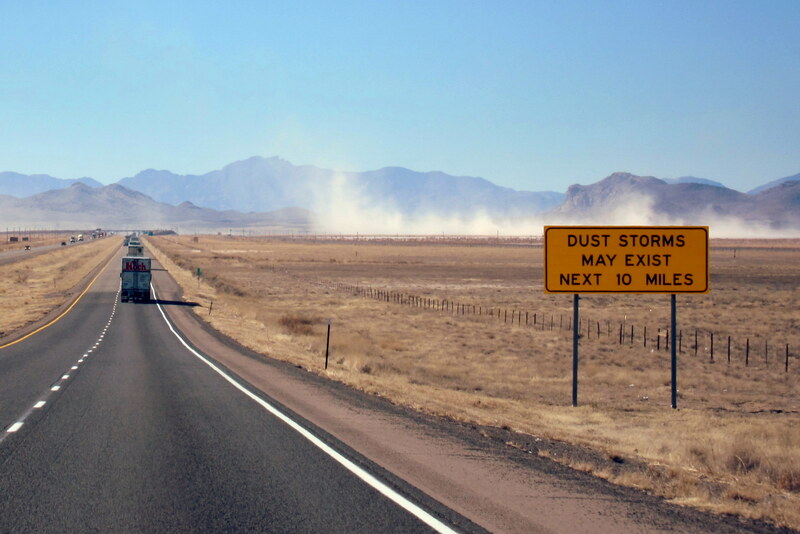 Monday, January 30, 2012: Having made our mark on White Sands National Monument we decided to head toward Silver City, New Mexico because, well…..we have never been there. In addition our favorite bruzzin-in-law and her sister just happen to be in that town for a few days. Bea and Jo actually went out of their way to scope out the campgrounds in the area and recommend one in particular for which we thank them. So, following breakfast, we climbed on US-70, known as the Battan Memorial Highway, and headed northwest. Right outside Deming, NM Kit noticed that gas was $3.09 a gallon so we pulled in to fill up. Amazing how one gets excited about gasoline near $3.00…..a sign of reluctant acceptance that the world oil industry has indeed got us by the you know what’s. Around 1530 we stopped in Deming, NM so Kit could once again “Occupy Wal*Mart”. I humored myself by people watching from a safe distance. The Wal*Mart chain of mongo-stores is a world class people watching venue. I was able to notch a sighting on my “Weird People of the World List” when I witnessed a young white gangsta looking dork pause by the deodorant rack. He quickly looked up and down the aisle and then proceeded to “sample” one of the products by liberally squirting each armpit. So if you ever notice that your Wal*Mart purchased deodorant doesn’t last as long as it used to…..you now know the rest of the story. Two hours later, we jumped onto US-180 heading north and pulled into Silver City at 1900. The dark of evening and a dimly lit campground could have made finding our way pretty interesting. Fortunately the owner heard us arrive and interrupted his dinner to guide us into our spot. All is well and following a quick snack it was off to bed. Tuesday, January 31, 2012-Silver City, New Mexico: Up early and a walk around to see what our new home looked like. 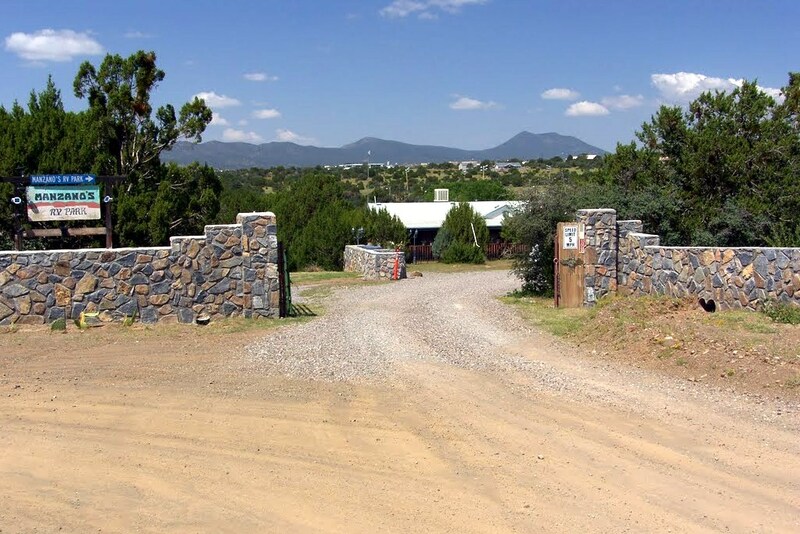 Manzano’s RV Park is a very nice campground located in a rural area approximately 6 miles south of town. The park was developed as a retirement project by Lico and Virginia Manzano on old family land. They hired an architect and engineer to ensure they would end up with a top rated facility. The young architect brought his RV’ing parents in on the project to ensure his plans would be suitable for folks that actually travel in campers…..something all RV Park developers should do. They had enough land to construct a cookie cutter mega resort but chose to feature 18 well-spaced sites while leaving much of the native vegetation intact. 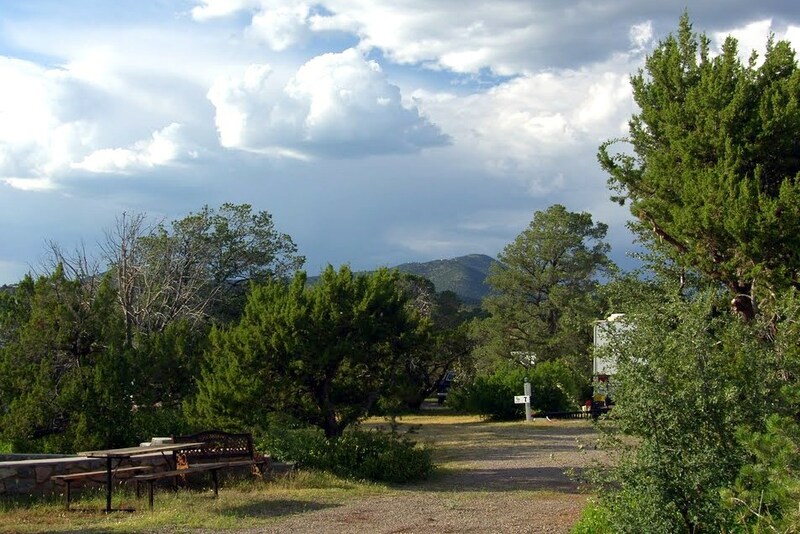 The result is truly magical and one of the best commercial RV parks we have stayed in. 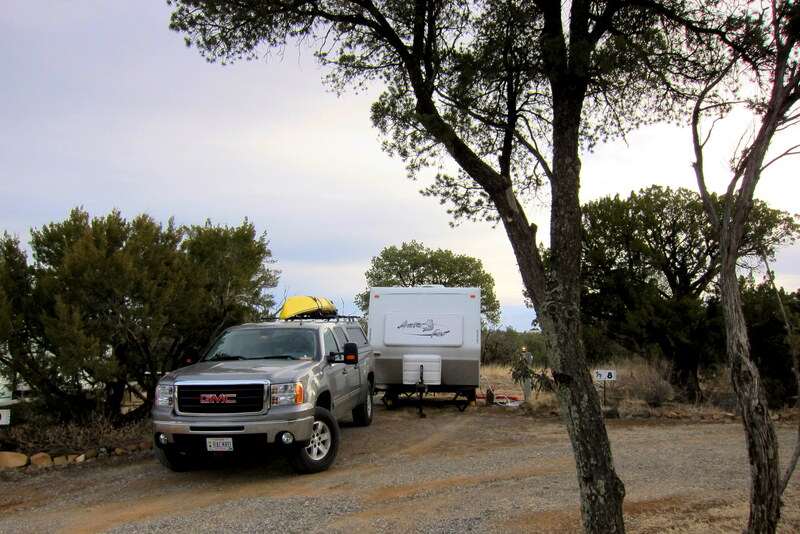 In addition, the rates were reasonable and the owners are very friendly and conscientious, catering to the need of every camper. At an altitude of close to 6000 feet, the overnight temperatures can drop well below freezing…..and such was the case during our stay. However with our 4 season capable RV we remained warm, cozy and comfortable. The daytime temperature quickly rebounded into the mid 60’s as the desert sun warmed the countryside. Kit and I made arrangements to meet for breakfast with Bea and Jo at Vickie’s Eatery, a popular restaurant that features homemade fare. Two of the folks in the above photo are from Maine, one is from Montana and the other is from Tucson…..can you tell who is from where? Following a fantastic breakfast and lively conversation, Jo invited us back to the place she is renting for a few months, a nice old home within walking distance of most everything. Since it was Bea’s last day in town we bid her a farewell and spent the rest of the day exploring the town. 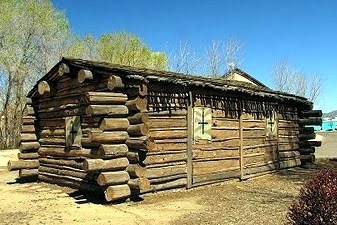 Silver City is just one of many 1860’s mining towns in New Mexico. 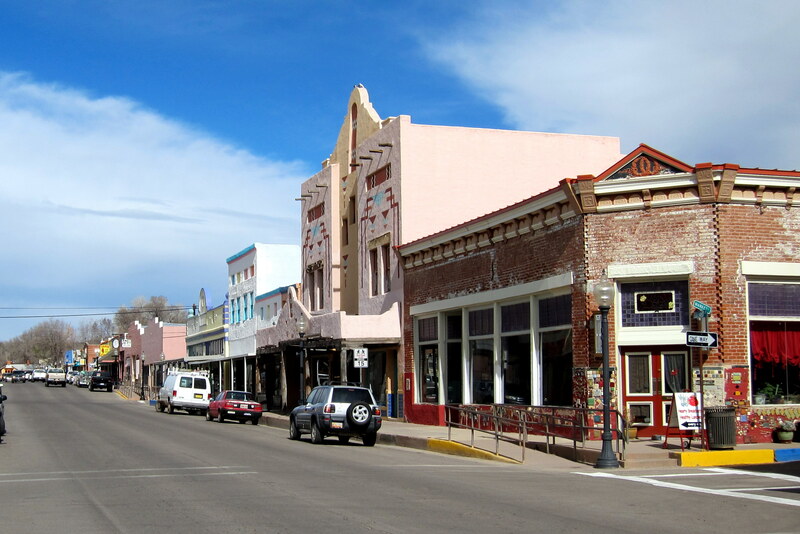 However, unlike other boom towns, Silver City is still thriving. It was founded by a gentleman named John Bullard who affixed his name to the only road in town and was promptly shot with an Apache arrow. There is an active copper (not silver) mine southwest of town that provides employment for many townsfolk. I’m guessing old John named his town Silver City because he knew a great many pensioners would likely discover the place as a decent retirement location. The use of “Strip Mining” technology in these parts is the preferred method to extract copper from the ground. I believe the term strip mining comes from the fact that everyone works naked which probably prevents miners from carrying out the product in their pockets. If you follow the news, you know that copper has become valuable to the point where crooks are cutting the stuff out of abandoned buildings and some live power stations. I think we all can help solve the copper shortage and help ourselves in the process. If every citizen would locate those Mason jars of pennies stashed around the house and then use the coins to pay their federal income taxes the government would be flush in copper. They Feds could then dump all that copper on the commodities market which would drive the price down and those poor miners can once again work in the desert sun fully clothed. And….. (Nope not done yet! )…..as a side benefit, the bazillions of pennies the Feds receive would keep the bureaucrats busy for the rest of the year and out of our hair…..I’d say a win-win! Town legend has it that young Billy was from a deprived and improvised background and therefore was not to blame for being a crook. The town marshal “Dangerous Dan Tucker” (yep…..look it up!) wasn’t swayed by local sympathies and threw Billy in the clinker on many occasions. Today old Dangerous Dan would be fired for cruelty to a disadvantaged citizen. OK…..back to reality…..honest! 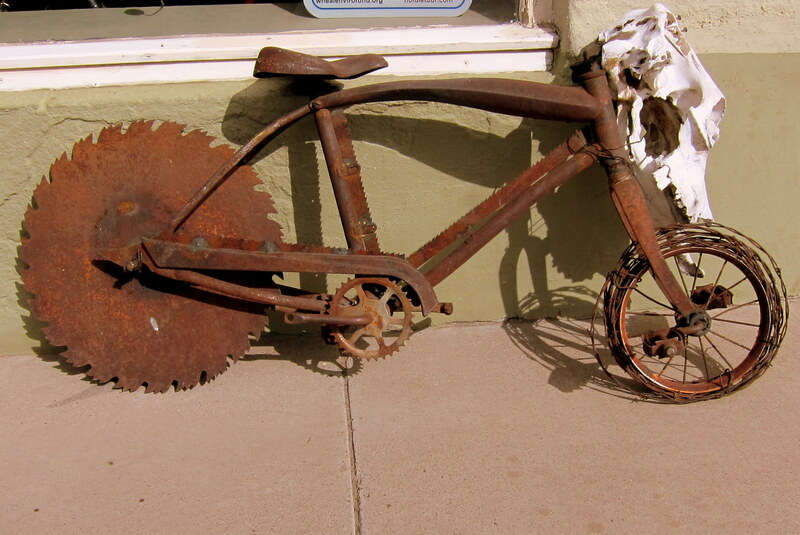 Walking down Bullard Street, I spotted this contraption outside the local bike shop and went inside to meet the owner and talk about, what else…..bikes. As Kit browsed the many antique, craft and quilt shops I spent my time visiting with the folks that chose to live, work and ride bikes in and around Silver City. Found out there are numerous multi-use trails in the mountains north of town that cover thousands of acres. Need to check these out! Kit and I met for a late lunch at Jalisco’s, another great recommendation by Jo and Bea. Over lunch we discussed staying an additional night so we could enjoy more of this area. 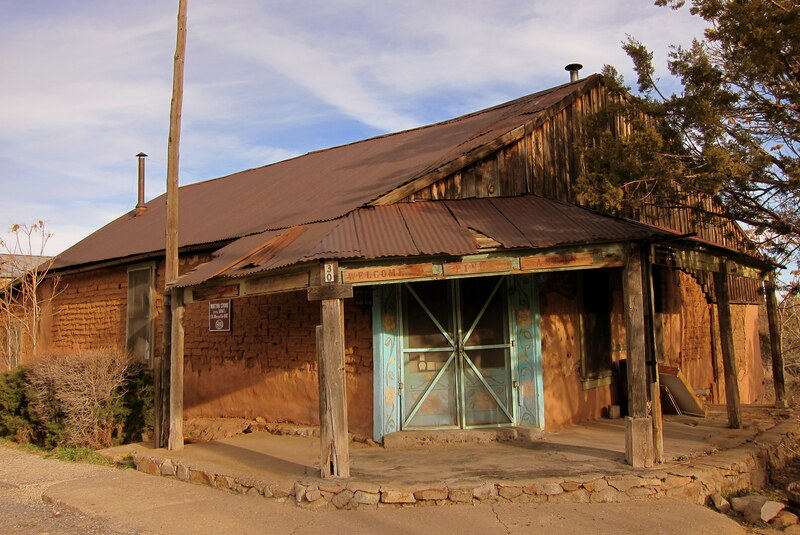 The decision was unanimous…..another day in Silver City it is! Wednesday, February 1, 2012: Woke to a cool clear morning and coyote’s howling off in the distance. Kit wanted a down day to read, knit and enjoy some Kit time so I took the opportunity to drive up into the mountains north of town. 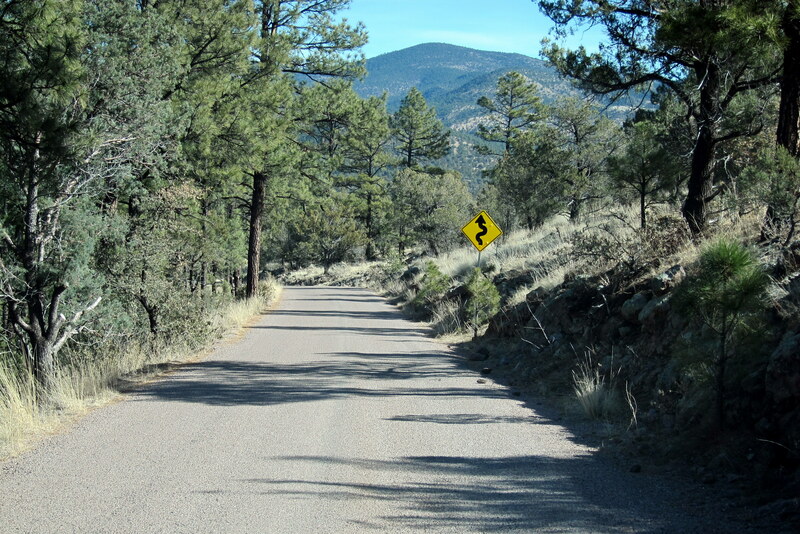 The road was narrow, steep and winding…..or, in my opinion, perfect! 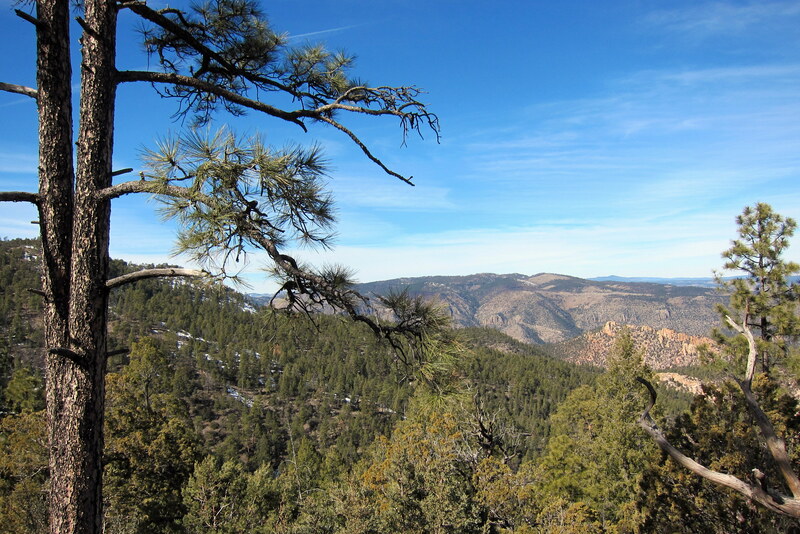 This is the Gila National Forest and was championed by the great environmentalist Aldo Leopold. It has the distinction of being the first national wilderness area set aside by the government to stay forever wild. There is only one way in, and that road only penetrates a small portion of this vast area. Gaining altitude, I began to see patches of snow and started to enjoy the cool crisp mountain air. This seemed a fitting opportunity to pop in my Ken Burns National Park CD and enjoy the trek. After two pleasant hours covering 42 miles, I came to the end of the road at the Gila Cliff Dwellings National Monument. As luck would have it a ranger was leading a small party up into the dwellings and I was able to tag along. 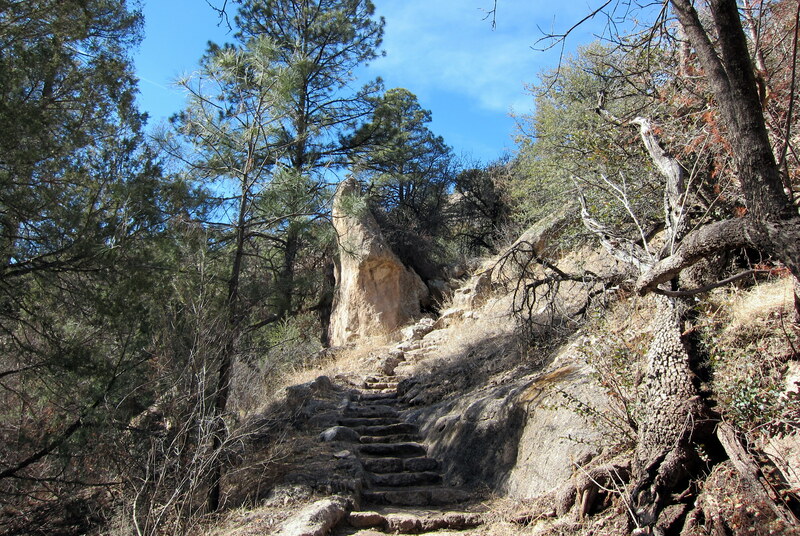 The hike to the ruins was an easy half mile jaunt over an improved footpath. The group started getting glimpses of our destination as we proceeded up the canyon wall. 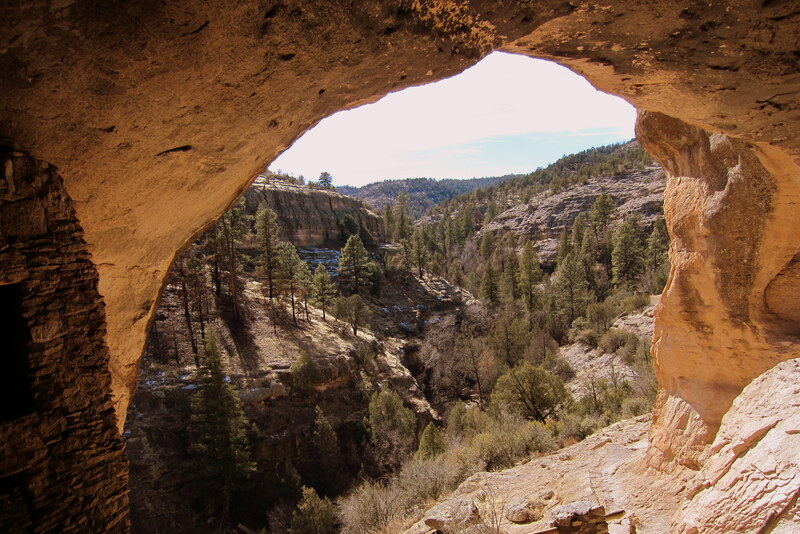 Soon, we arrived at the first of six caves that the Mogollon Indians used to build their homes and establish a community. 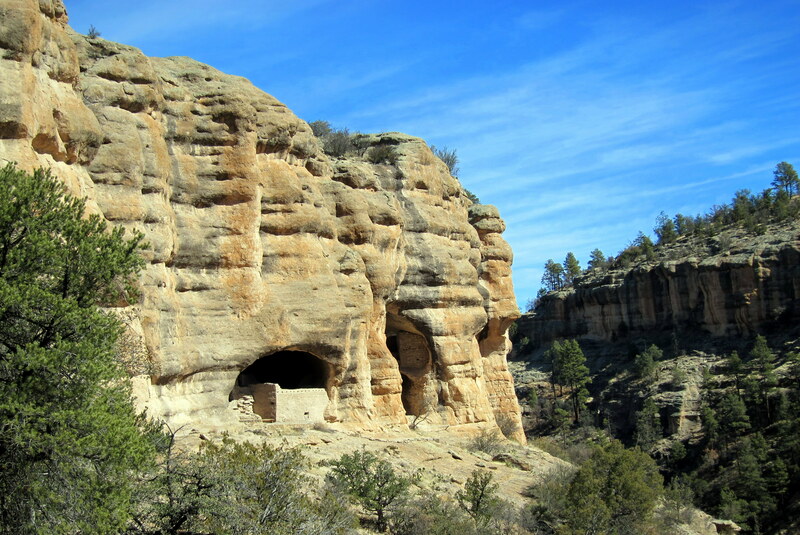 The ruins were remarkably intact due to the remoteness of the area and the fact that they were only occupied for about 11 years……something or someone caused the Mogollon People to leave their home rather abruptly. I was particularly impressed by the views out the openings that allowed the low winter sun to warm the chamber and keep the higher summer sun at bay. In addition I bet the view allowed the lookouts to detect any potential enemies long before they could reach the dwellings. Besides…..pretty nice view out anyone’s front porch, don’t you think? The 6 cave complex contains 40 separate rooms, and most have been identified as to use. Notice the soot still visible on the cave ceiling in the cooking room some 800 years later. 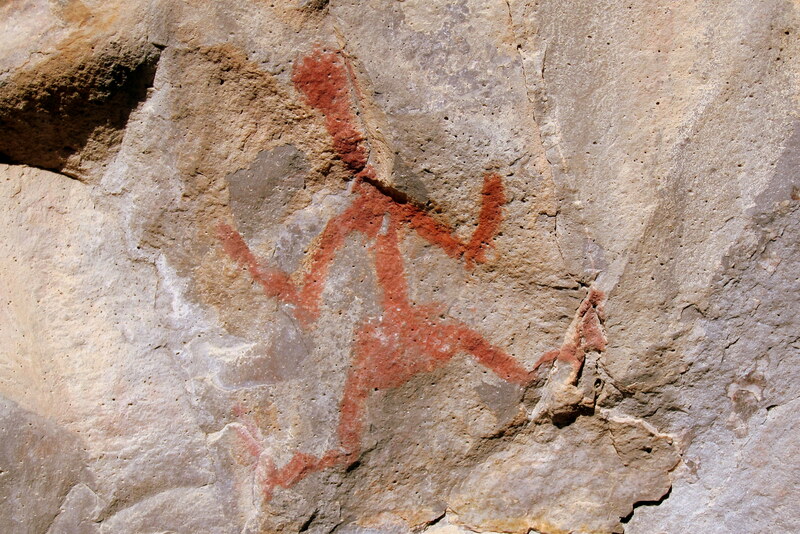 In addition, there were a number of pictographs still visible in and near the caves. I know it’s no longer politically correct to call an American Indian “redskin”, but look at the color they chose to depict their human form…..just saying. 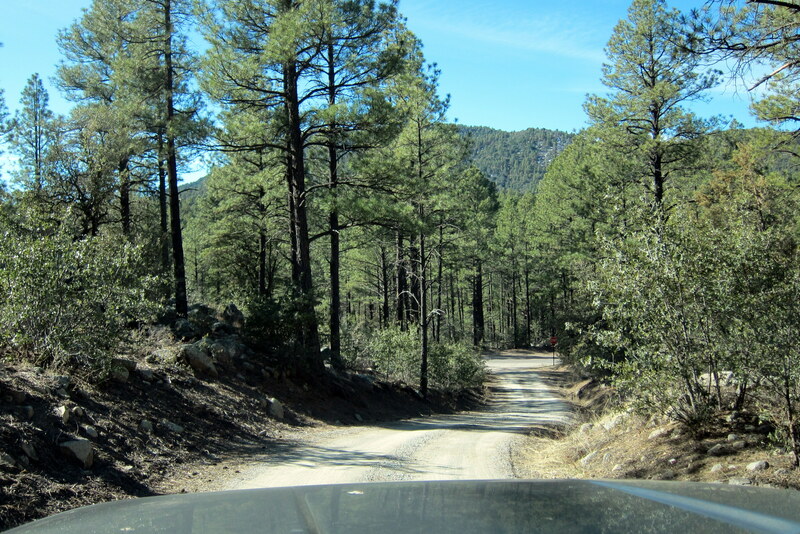 After the tour I retraced my path out of the Gila National Wilderness and took a detour through the old mining ghost town of Pinos Altos. 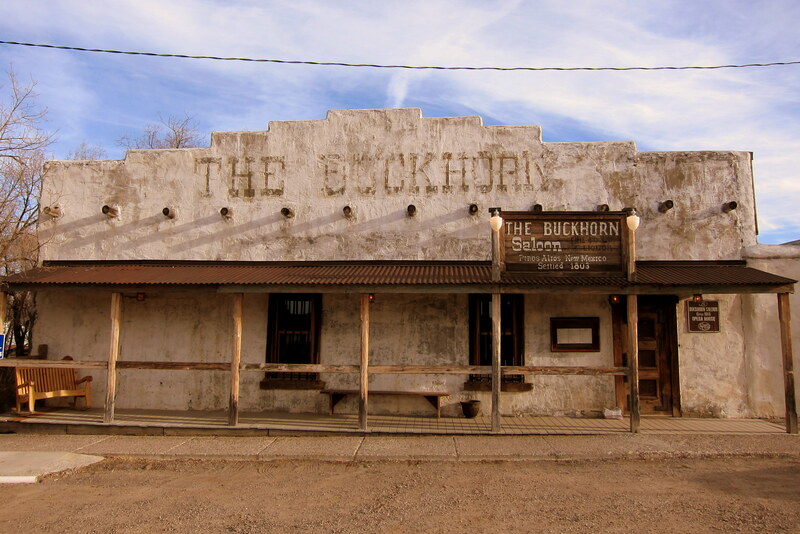 Many of the buildings still exist and a few have even been re-purposed into taverns and shops. As a point of irony, Pinos Altos is Spanish for tall pines which flourished in this area until 1870 when the miners and settler’s cut them all down to build their town. Rejoining Kit back at the campground we enjoyed some wine, dinner and conversation about our individual day’s activities. We both agreed that Silver City will be added to a continually growing list of places we want to return and explore some more. Thursday, February 2, 2012: Woke to a frosty morning under clear cobalt skies. While backing the truck in position to hook up the trailer I discovered that a regional horticultural pest, “The New Mexican Wandering Pinion” had positioned itself to impact (pun intended) my day. Ouch…..other that the cosmetic scar, and as you may know stuff like that bugs me, there is the problem of keeping dust and rain out of the truck bed where we store a bunch of stuff. In addition the door doesn’t lock anymore. 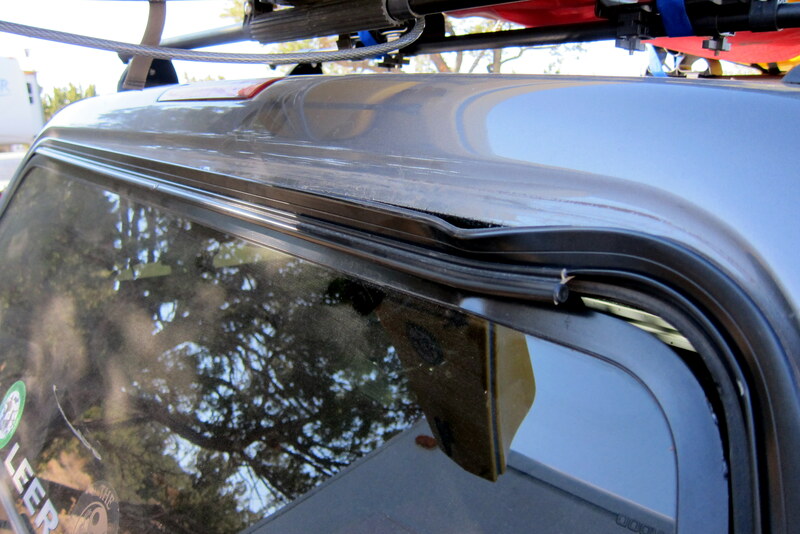 This issue will need fixing as soon as we get to Tucson…..where, coincidentally, we are headed next! On our way at 1040 heading west on US-90…..it is 43 degrees and the skies are clear. Within an hour Lordsburg, New Mexico comes into view and we decided to take I-10 west into Arizona. A few miles down the road we spotted this sign. Turned out that the dust storm wasn’t too bad, however as the dust subsided we encountered this uncomfortable sight. Yikes!!! It took a second to realize that the big rig was actually being towed backwards on the hook of a huge wrecker. Crossing into Arizona around noon we decided to take a break at the Texas Canyon Rest Area, a favorite stop of ours before rolling into Tucson. 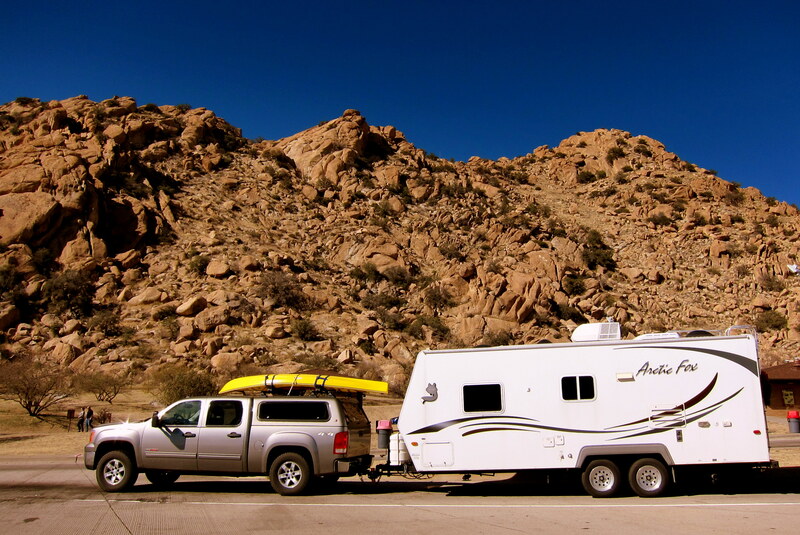 Following lunch and a walk around the picnic area, we once again merged onto I-10 and found our way to The Doobie RV Resort and Spa…..one of our all-time favorite spots to camp! Stay tuned for the next installment…..Fun in Tucson with Bruzzin Dew, Other Brother Dan and BFF Bea. And, lots of time with my 87 year old mom, better known locally as Whistle-britches. Kit’s Corner: We loved Silver City! Never knew a thing about it till Bea started talking about it. We hope to return some time to explore a bit more of the area. We’re both getting anxious to get to Tucson to see family. I’m not sure why he makes me add something; I can’t think of a thing to say…..
Hey, gas for $3.09 is great, saved enough to pay for the cap damage. (Major bummer) Tell the babe at the restaurant that she has an awesome hat! I immediately recognized the more conservative diners by their lack of headgear. I sent you a picture of my current desktop on your phone last week. You standing behind the ranger cutout holding the lamp? I’ll use that till another picture strikes my fancy. 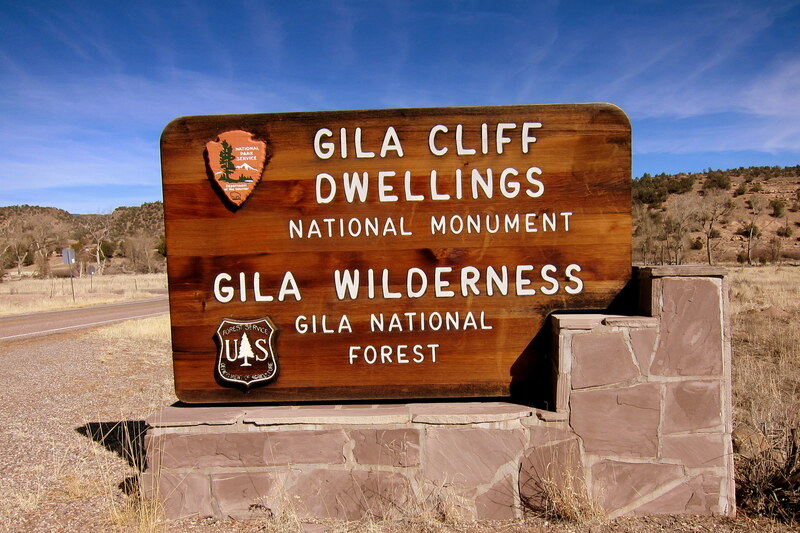 Bet the Gila Wilderness area has good hunting! You should keep info like that handy for us hunter types. (like the Indians?) Take care, say howdy to Kit for me. By the way, do you think the pictograph of the Indian was after a vasectomy? I don’t think they wore loin cloths at that point in history. Only explanation I could come up with? Even back then it got cold in the New Mexico Mountains so, unless an Indian wanted to be made fun of, he usually covered up! Really enjoy your journal entries! Enjoy the journey, you provide a prospective most people don’t hear about. Thanks…..great to hear from you guys……hope all is well! Gorgeous photos! I enjoyed your travelogue over coffee this morning. What is a New Mexican Wandering Pinion? Is there a joke in there I’m not getting? Great picture of you guys, Bea and Jo! Kinda like a Wandering Jew houseplant but bigger and meaner! I’M ROLLING MY COPPER PENNIES THIS AFTERNOON, WATCH FOR THE DROP IN COPPER COMMODITIES. GREAT WEATHER, UP TO ALMOST 50 TODAY. DUSTING OF SNOW LAST NIGHT. LITTLE JOHNNY COULD HAVE CHOSEN MO TOR! HEH HEH! Good point and good to hear from you. 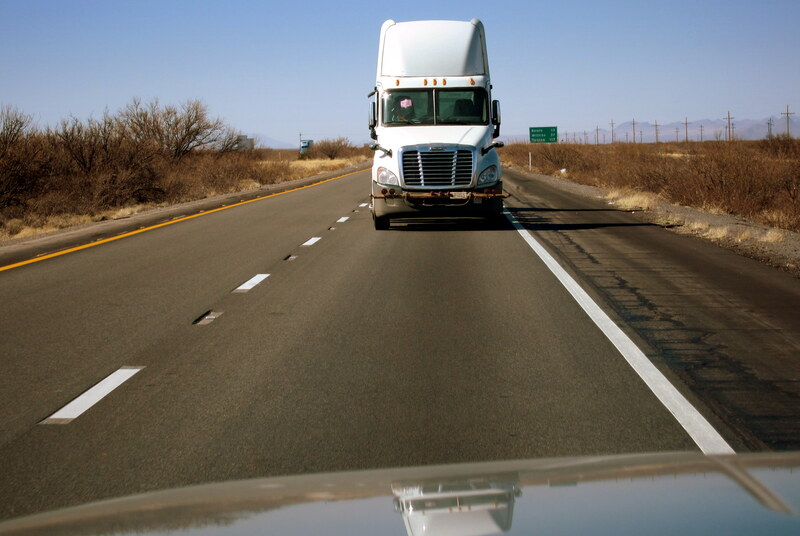 The tale of The Tweaked Truck Cap Caper continues (try saying that fast). 50 degrees in February in Maine! It’s barely that here…..3000 miles to the south!! Not fair!!! As always, beautiful. Through your eyes we are seeing so many great places in our country-totally stoked. Thanks we will because we are…..The Mother Truckers! Bill, Like I said yesterday when you guys were here……you have truly missed your calling. You need to write a book! It was so great seeing you both!!! It was my own Taste of Maine!!! Thanks for the nice compliment. it was great visiting with you as well and seeing your new retirement home! We thoroughly enjoyed Silver City last year, but didn’t spend enough time there. Maybe some year real soon we can meet up there for a couple of days on our travels. Love reading your stories and seeing the world through your eyes. 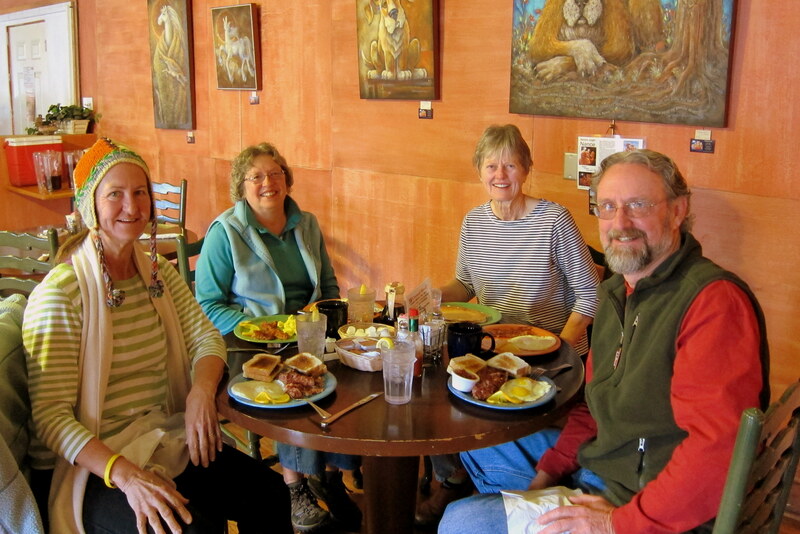 Thanks…..yep Silver City is an interesting place and the surrounding countryside deserves a lot of exploring as well. Congratulations to the newest CC Golf Pro…..is there a green jacket in his future? Thanks for letting us travel with you..the way you write makes us feel like we’re riding side-by-side with you!!! BTW..Pat still thinks you would’ve made a great looking cowboy! Thanks for the nice comment……looking forward to seeing you folks sometime this summer. Tell Pat I’m in the market for a ten gallon hat to complete the illusion. Met Bill on the hike up to the Gila Cliff Dwellings. Finally got around to checking out your website. Just wanted to tell you what a great job you do documenting your journeys with history, humor and pictures. Enjoyed revisiting our experience with you through your website. Keep up the good journaling and enjoy your travels. Thanks for the nice comment. If you folks ever get into New England, give us a call. Hope your travels are safe and pleasant as well.